The LG-637 rear activation Glock Gen 3 Crimson Trace red laser grip features Crimson Trace’s Instinctive Activation, which allows the laser to be activated from a normal firing grip by holding the back of the grip with the space between your thumb and the palm of your hand. A master on/off switch is included so you can quickly power down the grip, and it can be installed or removed in moments. The red laser is fully adjustable for wind and elevation with a sight visibility of approximately 0.50” at a 50’ distance. Improve your aim and add another layer of control to your firearm with this rear-activated Crimson Trace Glock Gen 3 laser grip. The following Glock models will fit with this grip: 17, 17L, 22, 31, 34, 35 & 37. Laser Visibility: ~0.50” diameter at 50 ft. 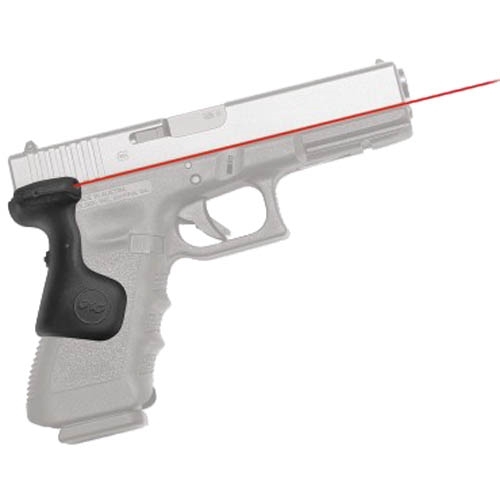 The Crimson Trace Glock Gen 3 LG-637 red laser grip has a weight of 0.3 lbs., a billable weight of 1 lb. and dimensions of 3.25” W x 2” H x 5.25” D. Shop with us today!